This article talks about easter, lent, ash wedneday. 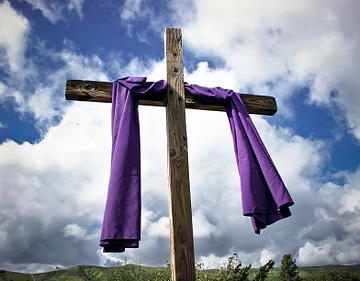 In its most traditional form, Lent serves as a time of preparation in the run-up to Easter and is observed from Ash Wednesday to Easter Sunday. In many churches the bright colours which followed Christmas will be replaced by more somber colours of black and purple, and it is the custom to remove the flowers and to choose songs and hymns which also reflect the season. On Easter Sunday the brightness of the flowers and the songs of praise and alleluia will be re-instated, thus adding to the joy and celebration of the day. Lasting forty days, many Christians draw inspiration from the account of Jesus being tempted in the desert, where for forty days Jesus, ‘full of the Holy Spirit’, was tempted by the devil. ‘He ate nothing and at the end of the time ‘was hungry’. For Jesus, this time in the desert immediately pre-fixed what is seen as the start of His ministry, it was for Him, a time of preparation. Lent should not be viewed as a legalistic or compulsory act, rather as a fantastic opportunity to set time apart for spiritual cleansing, renewal, and preparation. Although there is no specific mention of Lent in the bible, time set apart for repentance and mourning in ashes is referenced several times (see bible references). During Lent many will often fast from a meal or a luxury item and replace the time they would have spent eating, with prayer. Christians believe that because it was the sin of man that led Jesus to be crucified, Lent should be used as a time to reflect on the significance of Christ’s death, both for humanity as a whole and for their own lives. Further more, the season should serve as a time of self examination and confession of sins, of overcoming faults through penance, self-denial from certain items (fasting), of prayer and repentance, and of almsgiving. Use the season of Lent to give up something for God. This may be a meal each day, or a luxury item such as chocolate or alcohol. Perhaps you recognise that there is a piece of technology that you could ‘give up’ for Lent. For some maybe it’s a matter of not checking social networking sites for the season, but rather using the time for prayer and bible reflection. You may like to use the content on this site to help you in that. Use the season of Lent to re-connect with your bible and with prayer. A good start may be to read over the events in the Gospels which build up to Holy Week - Christ’s arrest, trial, crucifixion and glorious resurrection. Focus your attention on the suffering that Christ went through, and the purpose of that suffering. Explore Christ’s amazing grace and love. In view of this why not pause to consider your own sin, and spend time in prayers of confession and repentance. Put the money you saved by not eating to good use; give it away. You could dedicate the time your saved not on your computer or watching television to volunteering for a charitable organisation. Why not set yourself the target of doing one random act of kindness each day? Question for comment: How will you mark Lent this year?